Harley-Davidson® has got you covered in cold weather. 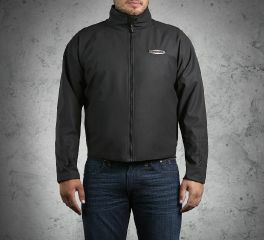 Our heated motorcycle jackets will keep you warm without the bulk on even the harshest of rides. Grab a heated motorcycle jacket liner to use as an extra layer when the mercury drops. Rack up more miles before and after the riding season with our convenient one-touch heated gear. The Heated One-Touch 12V Jacket Liner operates from a simple wireless wrist controller. This device is positioned in your line of sight to help keep your eyes on the road. Just a tap of the finger manages warmth and comfort. Engineered with seven heating panels (the most yet), this stylish layer is versatile enough to wear as a casual jacket, yet trim enough to wear as a bulk-free mid-layer. It plugs directly to the motorcycle's 12V DC power supply using a battery connecting harness for continual power no matter how long the ride. Our packable heated motorcycle jacket liner comes with a supply of functional features to extend your riding season. 55% polyester, 45% polyurethane outer shell. Polyester body, sleeve, and neck lining.